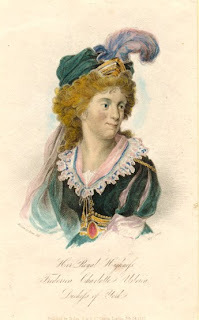 Frederica Charlotte of Prussia (1767-1820) — wife of George III’s second son Prince Frederick Augustus — was said to have very, very small feet. It was also said that she was short in height, not very pretty and had bad teeth. However, she was lively and sensible and expected to make Frederick very happy. 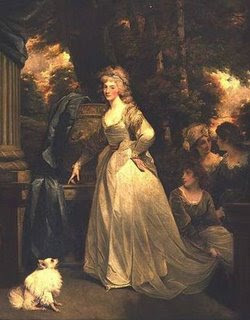 Frederica Charlotte Ulrica Catherina, Duchess of York by Marie Anne Bourlier after Elisabeth Louise Vigée-LeBrun, published by Edward Harding. 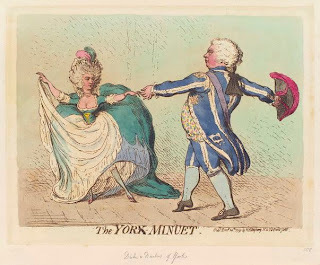 Frederick, the Duke of York, was eager to marry. He was the first royal marriage of all George III’s fifteen children and everyone was excited. After all, if he did, he would receive a handsome increase in funds. One thing Frederick wanted to do for his bride was provide her with shoes. His older brother George, the Prince of Wales, consulted the royal shoe maker. The duke sent the prince a pair of Frederica’s wee shoes to make six new pairs. The delicacy of Frederica’s tiny feet became the object of great curiosity. Although newspapers were scarcely able to mention the princess’s beauty, they praised her for her charm and “neatness”. Copies of her shoes were sold in the hundreds — purple leather shoes studded with diamonds, finished with a high heel and only… 5-1/2 inches long. Soon it became fashionable for every stylish woman to squeeze her feet into tiny shoes. The rage for the princess’s shoes became over the top. 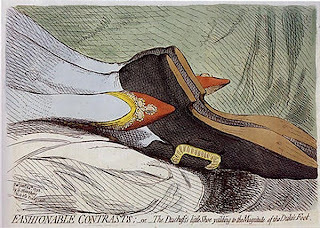 James Gillray summed up the whole frenzied madness in one cartoon caricature titled “Fashionable Contrasts” showing Duchess teeny feet dwarfed by the Duke’s. ‘Fashionable Contrasts’ by James Gillray (1792) National Portrait Gallery. Unfortunately, as the marriage progressed, it was not as agreeable for both parties. The Duchess, called “Freddie” by her friends, became a bit more eccentric as the years went by keeping to herself and doting on her 18 dogs in their large estate. Life at the estate provided the privacy the Duchess wanted. She was known to stay up until dawn reading books, sleep until 3 in the afternoon, get up and play with her dogs, then read until dawn again. Her mad, controlling, but sometimes very wise father-in-law, George III, was sympathetic and felt without children she needed to rest her affection on her dogs. 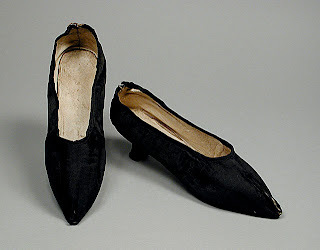 top image from LACMA: a pair of English shoes, though not the Princess’s, is made from satin, leather, linen (1790-1795) and the size… 9-1/2 inches.